Voting has drawn to a close on Russia’s nationwide election day, which sees officials elected to the federal parliament and dozens of municipal and regional bodies. Spanning 11 time zones, the voting took place over 22 hours, with each polling station open from 8:00am to 8:00pm local time. The Organization for Security and Cooperation in Europe (OSCE), which sent several hundred observers to monitor the Russian elections, noted an increased level of transparency in the electoral process, although it said problems still remain. The International Election Observation Mission, which is a joint undertaking of the OSCE Office for Democratic Institutions and Human Rights (OSCE/ODIHR) and the OSCE Parliamentary Assembly (OSCE PA), consists of 482 observers from 44 countries. “The improved transparency and trust we have seen in the election administration are important steps,” said Ilkka Kanerva, a Finnish parliamentarian and the OSCE’s special coordinator for the elections. However, the OSCE noted “low-key” campaigns and voter engagement, an “overly complex” legal framework, and administrative resources misused for campaign purposes, among other issues. 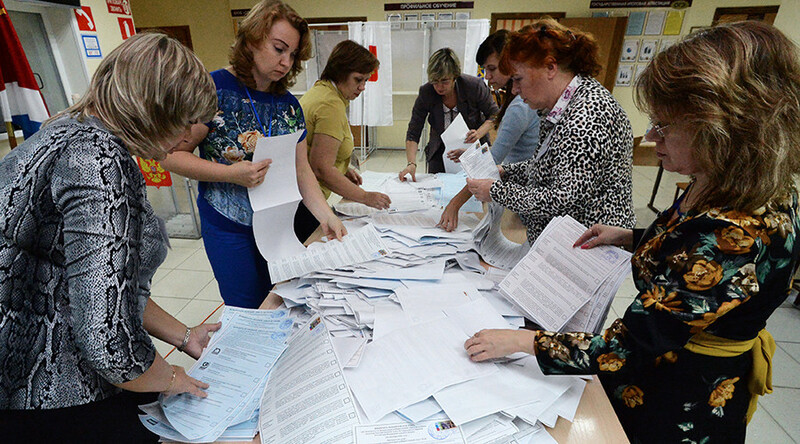 The OSCE said the Russian Central Election Commission (CEC) received as many as 1,896 ‘applications’ which cited alleged violations in the electoral procedures, and reviewed 12 of them in a transparent manner. “All other complaints were considered by individual commission members in a process lacking transparency,” OSCE said. “Election day was orderly overall, but the long-term observation showed that challenges to democratic commitments remain, especially with regard to the media, candidate registration and legal framework,” said Ambassador Jan Petersen, Head of the OSCE/ODIHR long-term election observation mission. Communist Party of Russia leader Gennady Zyuganov believes that the results of yesterday’s parliamentary elections look rather suspicious, with the ruling party still managing to gain a majority of votes, even though its performance in recent years has been on the decline. In 2007, nearly 54 million people voted for United Russia. In 2011, Putin’s party had 12 million less supporters, while this year it has garnered 5 million votes less, he said at a news conference. “The way United Russia acts is destroying the political system in Russia, deceiving its people and offending those who trust in other parties. If Putin and his supporters keep sticking to this scheme… we should expect a lot of difficulties in the future,” Zyuganov noted. The Russian Investigative Committee has opened a criminal investigation into allegations of election fraud in the central Russian city of Rostov-on-Don. A video posted on YouTube showed a woman putting a number of ballots into the ballot box while two other women hid her from the observers. The criminal case was launched against the woman, who was the secretary of the local election commission. Both the election commission and the Investigative Committee said they are looking into the incident. Election results at one of the districts in Nizhny Novgorod Region, central Russia, have been determined to be invalid due to numerous breaches, Central Election Commission head Ella Pamfilova said. At another electoral district in the southern republic of Dagestan, the elections were declared invalid as well, according to the Central Election Commission. The United Russia party is set to have a total of 343 seats in the 450-member lower house of Parliament: 140 of them come from party lists, and 203 are single-constituency candidates. The Communist Party (KPRF) gained 42 seats, the Liberal Democratic Party (LDPR) - 39 seats and Fair Russia - 23 seats, the Central Election Commission said after counting 93 percent of the ballots. Turnout across Russia has been estimated at 47.81 percent, while in Moscow, it is 35.18 percent, according to the Central and Moscow City Election Commissions. 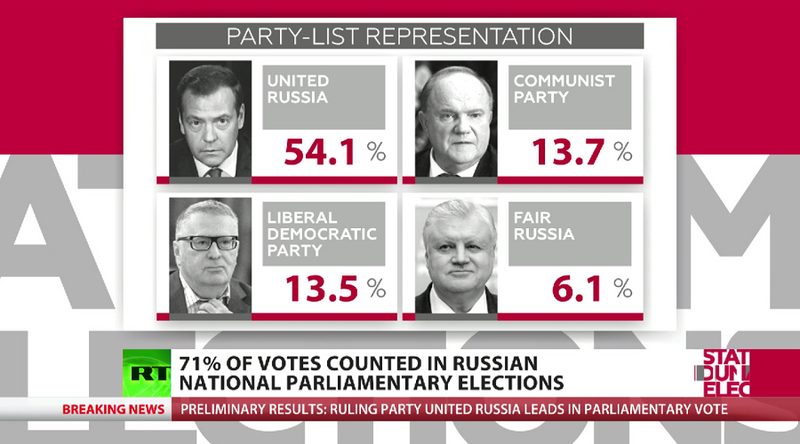 The ruling United Russia party has 54.2 percent of the vote after 90 percent ballots have been counted by Monday morning, data from the election commission shows. 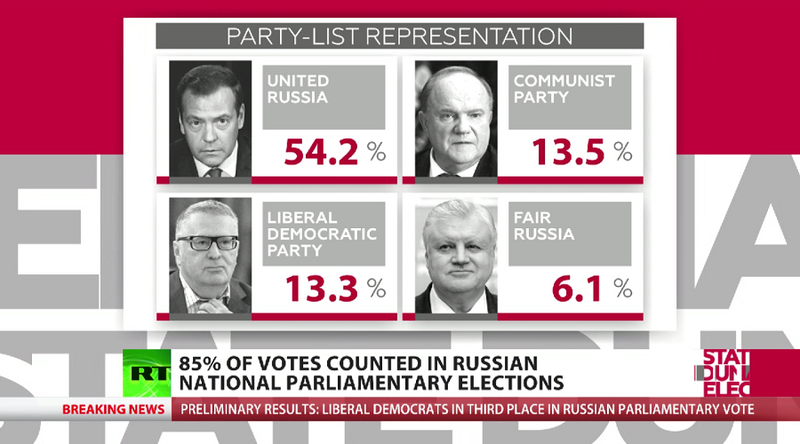 The Communist party is in second place with 13.5 percent of the vote, followed by the Liberal Democrats party (LDPR) on 13.3 percent and the Fair Russia party on 6.2 percent, according to the incomplete vote count. Главное табло ЦИК РФ в режиме онлайн! Russian people support political stability, Vladimir Putin said as he visited the United Russia campaign office. “The situation is not easy and people see it – and they want the political system and society to remain stable,” the president said, as quoted by TASS. “Ordinary people know that empty promises are worth nothing,” he added, commenting on preliminary election results and stressing that United Russia will continue its work aimed at Russia’s development.